Please refer to our stock # 01881 when inquiring. 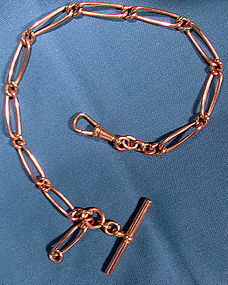 A Victorian RGP or rolled rose gold plate watchchain with a swivel and t-bar circa 1900. This twist style 12" long open link antique watch chain is 1/4" wide and it has a loop drop from the t-bar (which kept the chain in place by being anchored through the vest buttonhole) for suspension of another decorative accessory, either a gentleman's pocket watch or fob or watch key. It would also make an interesting bracelet or necklace. There is a loop marked rolled gold with the maker's mark for Kollmar and Jourdan , a Pforzheim Germany manufacturer founded in 1885. Rolled gold plate is a quality gold plate, with a sheet of gold rolled over the base metal. . It is in excellent antique condition with no dents, bends, corrosion, losses, damage or repairs. Besides being a handsome style of chain, it would also make an attractive double bracelet for those with the wrist to fit. All items are thoroughly and conservatively graded and all condition issues are noted; all items are vintage or antique and may have slight signs of gentle use as would be expected. Silver and silver plated items are hand-polished, not buffed, and our halogens and magnified images may exaggerate otherwise barely noticeable scratches and flaws. GUARANTEE: ALL of our items are antique or vintage and from the period listed. NONE are reproductions or recreations. Tracked packet insured air shipping to the U.S. starts at $13.75 and expedited shipping within Canada starts at $9.50. Rates vary by destination, value, size, weight, payment option and shipping method. Other payment, tracking and insurance options are available - please inquire. We ship worldwide - please contact us for an accurate shipping quote with your postal code or country. **** PLEASE NOTE: We DO NOT ACCEPT PAYPAL**** © Fiona Kenny and www.fionakennyantiques.com. Unauthorized use and/or duplication of any part of this material without express and written permission from this site’s author and/or shop owner is strictly prohibited.